Just last week we were being wowed by the 91.24% screen-to-body ratio of the Vivo Nex - not to mention its pop-up camera and in-display fingerprint scanner - but it's about to become old news. 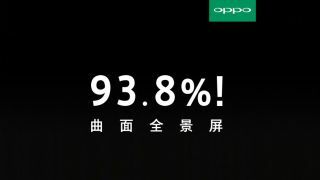 That's because Oppo has been teasing its new flagship smartphone, due to launch tomorrow, with a 93.8% screen-to-body ratio. The Oppo Find X has been outed on Chinese micro-blogging website Weibo, with a picture of the phone showing just how much space the screen takes up on the front of the device. As you can see from the images below, there is a slender chin at what we believe to be the base of the handset, and Oppo says the display itself is curved - so it could have a similar look and feel to the Galaxy S9 and S9 Plus. There's no official word on the handset's features, other that its huge screen, but if it follows in the footsteps of the Vivo Nex we could well get an in-display fingerprint scanner and a Snapdragon 845 chipset under the hood. Whether or not we'll also see a pop-up camera from Oppo remains to be seen, but all will be revealed very soon. TechRadar will be reporting live from the Oppo Find X launch in Paris on June 19 to bring you all the latest about this all-screen smartphone.